“Elmore chose the Western genre to break into writing because he loved Western movies. He grew up in the Golden Age of the Western. Here are five of his favorites. One of my all-time favorite authors, Elmore Leonard was quite a novelist and screenwriter. 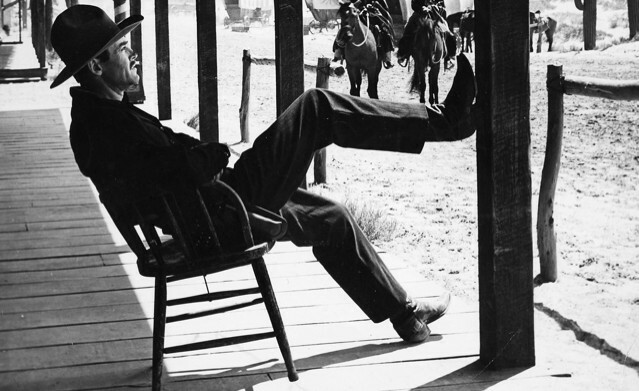 Whether it was a compelling crime story or western, his realistic tales always offered strong dialogue and unique characters. So whatever interested and/or influenced him, I want to know it. This list of the late-author’s favorite westerns, a genre he began his career with, is definitely worth a look. grind of continuous patrols and convoy protection. Still think Joanne Dru gives one of her best performances. A refreshing change from ”Fort Apache’ and ‘Rio Grande’. Though ‘Fort Apache’ has a better, more action filled finale. And Ben Johnson is just plain good in anything. He is a legend that’s for sure.